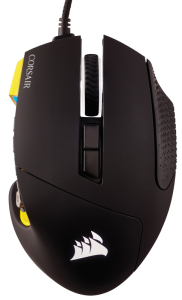 The new SCIMITAR PRO RGB gaming mouse was recently announced by Corsair. 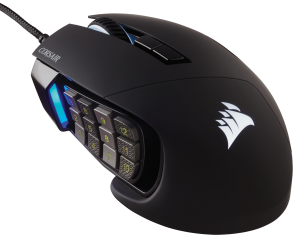 Based on the same award-winning Key Slider™ 12 side-button design as the CORSAIR SCIMITAR RGB, the SCIMITAR PRO RGB adds onboard profile storage and a state-of-the-art native 16,000 DPI PMW3367 optical sensor developed in partnership with PIXART for precise control in single DPI steps for ultra-accurate, high-speed tracking. The SCIMITAR PRO RGB also adds a comprehensive set of hardware playback options for both programmable buttons and RGB lighting effects, allowing gamers to save up to three profiles of keyboard shortcuts or RGB lighting right to the mouse. 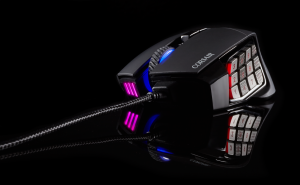 Engineered to revolutionize MMO and MOBA gameplay, the SCIMITAR PRO RGB has everything gamers need to conquer quests, win rounds and defeat the competition, all at the click of a button. Designed from the start to give MMO and MOBA gamers the edge, the SCIMITAR PRO RGB is crafted to fit the contours of your palm, no matter your hand size, and provide comfortable, assured grip even over epic gaming sessions. Central to this is the exclusive patent-pending Key Slider™ system, allowing the 12 mechanical side macro buttons to be repositioned by up to 8mm, keeping every key within reach and exactly where you need it at the crucial moment. Pre-loaded with three profiles of common shortcuts for MMOs, MOBAs and productivity, the SCIMITAR PRO RGB’s hardware playback makes it easy to customize control in your favorite games. Each of the SCIMITAR PRO RGB’s 17 buttons can be fully remapped in CORSAIR Utility Engine (CUE) software, with the macros saved to onboard memory for use on any system. The SCIMITAR PRO RGB also boasts four-zone RGB lighting, with gorgeous multi-color lighting effects and colors saved to onboard memory. At its heart, SCIMITAR PRO RGB is powered by a custom gaming grade 16,000 DPI PIXART optical sensor. Granting phenomenal accuracy and high-speed tracking, the sensor’s DPI is adjustable in as little as single DPI increments using CUE, allowing players to tune their sensitivity settings to exactly their preference and prevent misclicks and over-shoots. What’s more, the SCIMITAR PRO RGB can actively tune its sensor to optimize performance for virtually any gaming surface using the surface calibration utility in CUE. Ultrafast 1ms lag-free game play: Supports up to 1,000Hz/1ms USB refresh rate for a nearly instant response to your movements. The SCIMITAR PRO RGB is available immediately from the CORSAIR worldwide network of authorized retailers and distributors and is backed by a two-year warranty and the CORSAIR worldwide customer support network.